Today’s PS Challenge comes from the dining area at Walker Burger in Walker CA. My lovely bride and I took the Bullitt for a spin and ended up there. Love their burgers! If you haven’t had one, you don’t know what you’re missing! But those if us who have eaten there know! 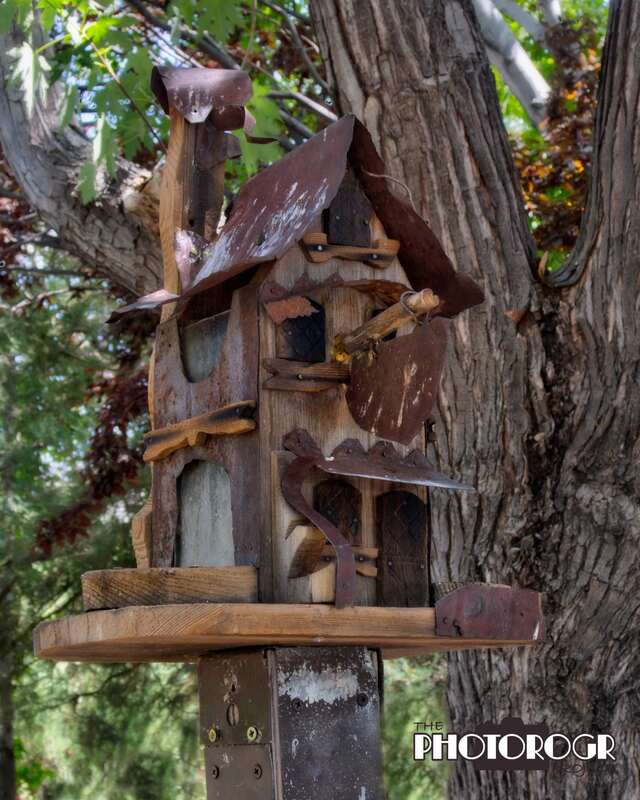 They have a wonderful outdoor eating area with picnic tables, trees, lawn, yard art, and bird houses and feeders. I tried to catch some of the little birds on the feeder, but you can imagine how that went. Here’s one of the beautiful bird feeders/art works on display. I bracketed exposures, processed it in PhotoMatix and PhotoShop, and added a little filter from On1 PhotoRAW.